“Please pay us” is the secret message in this forecast. As the government shutdown lumbers onward, federal employees are staring down a potential problem. Some 800,000 people will be at risk of furlough, but many other government workers–those deemed essential by the feds–are reporting to work as if nothing’s wrong. However, something is wrong; essential employees are working without pay, and will be working without pay for the foreseeable future. Speaking of both essential employees and seeing into the future, the weather geniuses at the National Weather Service are currently slaving away in front of their computers without a single dollar as thanks. 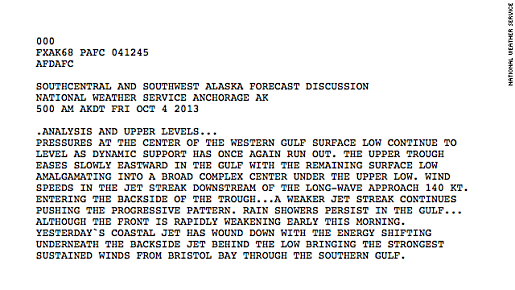 Employees at the Anchorage, Alaska, office of the National Weather Service have a secret message for their employers: “please pay us”. Of course, the NWS office can’t comment on it, because they can only comment on weather and weather-related phenomenon like meteor showers, so we don’t know if it’s a joke, if it’s deliberate, if it’s a prank, or if it’s a really, really unlikely accident. I like the idea of a silent protest by our nation’s hard-working meteorologists, if only because a bunch of awesome weather nerds don’t seem like the kind of guys who’d complain too loudly or violently about having to wait for their pay. Don’t worry about their future; all essential government employees will receive back pay when the government lumbers back into gear. I just hope this shut-down doesn’t last too long, because a lot of people will be hurting for money if this continues.